Wow, the 2018 Bow Season starts in just a few weeks, this summer went way to fast! As always we want to wish everyone a safe, fun and successful hunting season! Please make sure you keep us updated with reports of your hunts successful or not. The site was down for a day due to our server having some hardware issues, we have restored it to a new server while the old one is being fixed. During the restore process we also upgraded the forum software. There may be some issues here and there on the site but we are working to fix them, please let us know if you notice anything acting up. We wanted to point out a few important threads on the https://huntingny.com/forums/ forums to check out. The 2018 "Live From the Woods" thread is up and ready for live action from the woods, 9th year in a row! Post your sightings, stories and pictures -> https://huntingny.com/forums/topic/47908-live-from-the-woods-2018-lets-hear-stories-and-see-some-pictures/ 2018 HuntingNY Whitetail Classic - You can sign up for the contest by replying to this thread, sign up is active NOW and will end at Midnight on September 28, 2018 at which time this thread will automatically lock. In the contest section, each hunter will get their own thread, in which entries should be posted. Contest entries must be submitted by Midnight on January 2, 2019 (Sorry, seasons that run into 2019 are not included in this contest). https://huntingny.com/forums/topic/47098-2018-huntingny-whitetail-classic/ As always there are some amazing trail camera photos up, some real nice deer have been posted, check them out -> https://huntingny.com/forums/forum/23-trail-camera-pictures/ Be sure to also check out the 2018 Archery Harvest Thread -> https://huntingny.com/forums/topic/47911-2018-huntingny-bowarchery-harvest-thread/ And of course check out the main Bow Hunting -> https://huntingny.com/forums/forum/16-bow-hunting/ and Deer Hunting forum here - > https://huntingny.com/forums/forum/11-deer-hunting/ Hot Topics! The Shot That Counts -> https://huntingny.com/forums/topic/47369-the-shot-that-counts-2018/ Whats for dinner tonight, game recipies -> https://huntingny.com/forums/topic/23281-whats-for-dinner-tonight/ Hunter Harassment - Have you ever been harassed? -> https://huntingny.com/forums/topic/47493-hunter-harassment/ Which hunting weapon and seach do you like the best? -> https://huntingny.com/forums/topic/47874-which-hunting-weapon-and-season-do-you-like-the-best/ Most wanted bucks for 2018, some great pictures here! -> https://huntingny.com/forums/topic/46959-most-wanted-for-2018/ DMP / Doe Tag Swap -> https://huntingny.com/forums/topic/47909-dmp-tag-exchange-swap-donate/ If you are a Facebook user, please give us a "Like" our Facebook page here: http://www.facebook.com/HuntingNY and help spread the word. The site has grown leaps and bounds since started, there are over 685376 posts as of today! Please remember to tell friends and family about the site, you can even forward them this email / link. If you have a hunting related business (ex. 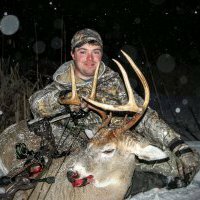 hunting store / archery shop), hunting club or organization, or a hunting related website you want to share with members we have opened up a link sharing system here: https://huntingny.com/links Just select the category and click "Add Link" on the right side of the page. If you have any interest in sponsoring the site you can contact us by using the contact form located here: https://huntingny.com/forums/contact/ Thank you Be safe, have fun, and good luck this 2018 season!